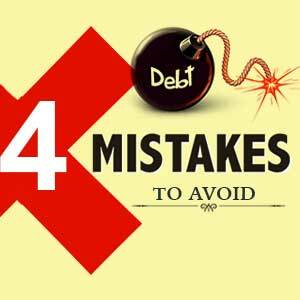 However, here are some of the common mistakes which you might commit while paying back your debts. Are you trying to repay your credit card debts? You might pay back your debts all by yourself or with the help of a professional organization. However, here are some of the common mistakes which you might commit while paying back your debts. The knowledge will help you avoid committing these mistakes and you can repay your debts, with ease, till the last cent. Getting help from a non-reliable company - If you opt for professional help, then choose a reliable company which has been into business for at least 3-5 years and it should have a satisfied clientele. Therefore, always check the BBB (Better Business Bureau) record to make sure that there are no outstanding complaints against the company you've chosen to get help. Not paying back remaining balance within low rate period - You might take out a low rate card to opt for balance transfer method in order to repay your existing high interest credit card debts. However, you need to pay back the remaining amount within the due date period; otherwise, you need to pay interest, on the remaining debt amount, which is quite a lot. So, you need to pay back the remaining amount within the low interest rate period. Making payments on the basis of verbal agreement - You should never make payment on the basis of verbal agreement with a creditor to settle the debt. If you start making payments on the basis of verbal agreement, then the creditor may deny later about the debt payoff amount. Therefore, always make a proper agreement before you start making payments to any creditor in order to settle debts. Using debt snowball to repay all your debts - Using debt snowball strategy may help to keep you motivated to repay till the last cent. However, you will ultimately pay lot more if you use debt snowball strategy to repay all your debts. This is because the longer you take to repay your high interest debts, the more you'll end paying on your debts. Therefore, if you have multiple debts to pay off, then use both snowball and avalanche to repay your debts. You may repay your lower balance debts using the snowball strategy but use the debt avalanche method to pay off your high interest debts. Above all, you need to change your overspending habit in order to remain debt free even after paying back your current outstanding debt. The condition worsens when you take out a home equity loan in order to repay your current debts. This is because, if you cannot change your overspending habit, then you'll never be able to get out of debt completely. So, the first thing you should do in order to get out of debt is to plan a suitable budget and follow it, so that you're able to save significant amount and use it to get out of debt and remain debt free throughout your life.